Papillary necrosis can also be easily detected with CTU. As on EU, it can have a variety of appearances. There may be small linear or rounded collections of contrast material in the renal pyramids (Fig. 9), contrast material surrounding the necrotic papillae, or merely caliectasis. All of these changes represent permanent and irreversible damage to the renal papillae. Figure 7 Blood clot. (A) A large blood clot fills and expands the right ureteral lumen on an excretory-phase axial image in this patient with a right renal transitional cell carcinoma. Note that the blood clot is surrounded by a rim of contrast material-containing urine (arrow). (B) Right posterior oblique coronal volume-rendered reconstruction also easily demonstrates the blood clot, which conforms to the shape of the dilated proximal right ureter (arrow). of bacterial infection. The medullary and papillary necrosis produced small (usually less than 5 mm maximal diameter) areas of decreased enhancement in the renal medulla in these patients. Of the 39 patients, 28 then received antibiotic treatment, and follow-up CT demonstrated resolution of the abnormalities in more than half (16 patients). Figure 8 Renal tubular ectasia. (A) Areas of very high attenuation are noted within or adjacent to the calices in this excretory-phase axial image, when viewed using standard soft tissue windowing (arrows). 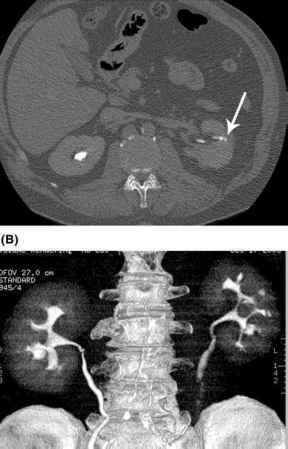 (B) When the same image is viewed using wide windowing, discrete linear collections of contrast material can now be identified in the renal pyramids (arrows), establishing the diagnosis of renal tubular ectasia. This diagnosis would not have been made had the image been evaluated only at soft tissue windows. Caliceal diverticula appear as water attenuation lesions on precontrast and, often, on early enhanced images but usually fill in with contrast material on the excretory-phase images. 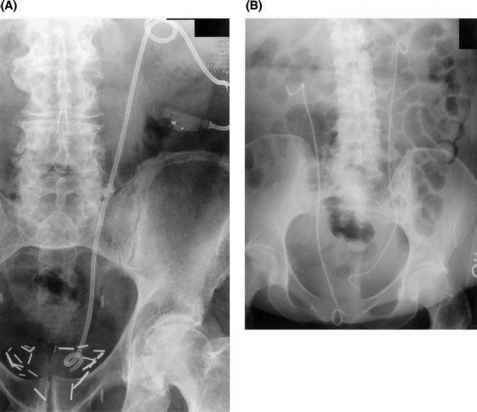 Three-dimensional reconstructed or reformatted images can be obtained to assist the radiologist or urologist in preprocedural planning if intervention is anticipated (usually with percutaneous nephrostomy or retrograde catheteri-zation followed by ablation) due to the presence of stones and/or infection within the diverticulum (Fig. 10). 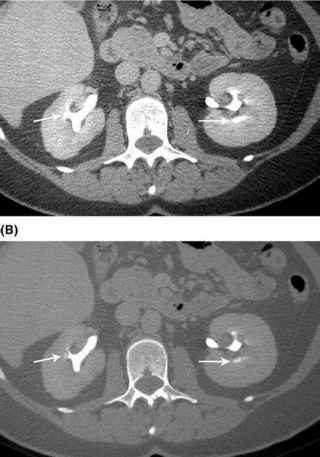 These additional images may allow the interventional radiologist or urologist to better visualize the relationship of the caliceal diverticu-lum to the adjacent renal collecting system. Figure 9 Papillary necrosis. (A) A tiny extracaliceal collection of contrast material is noted (arrow) in the lateral aspect of the mid-left kidney on this excretory-phase axial image. (B) This area of papillary necrosis is also easily identified on a coronal volume-rendered 3-D reconstructed image. The tiny impressions from the submucosal ureteral cysts that occur in pyeloureteritis cystica are best (and often only) seen on CT urographic studies when wide-window images are reviewed. As with renal tubular ectasia, changes of pyeloureteritis cystica may be obscured on standard soft tissue windows. Given the characteristically large number of cysts, their mural location, and the similar size of these cysts to one another, a specific diagnosis of this entity can frequently be made (Fig. 11). As with upper-tract cancers, bladder cancers can produce large masslike areas of bladder wall thickening, in which case the diagnosis is strongly suggested (Fig. 12).